Amidst a great uproar, controversy and hype, the much-talked about Pawan Kalyan starrer, ATTHAARINTIKI DAAREDI has released! Apart from the buzz the film has created so far, it is the ATTHA (aunt) factor, which is wooing d Telugu audience now. In the light of this hype and hooplah, it is necessary to make a sneak peak into the films made on relationship between ATTHA and ALLUDU (son- in- law), as main story line in our Tollywood! In our Telugu culture and family lifestyle, Aunt is always an important character as the mother of the bride and has an equal importance and special attraction on par with her daughter, to the son-in-law. This unique social phenomenon has already been identified by the film makers and created variety of films on this issue. These films have succeeded in portraying the unconscious desires of the masses on screen and satisfied the innate urges and wishes, by which these films have turned out to be the box-office hits! The special relationship of ATTHA and ALLUDU had been recognized by none other than K. BALACHANDAR for the first time to translate it into an interesting family drama. Thus came the film, BOMMA BORUSA in the year 1971, where a challenge between the Aunt and her son-in-law had become the theme of the film. In this film, S. Varalaxmi and Chandra Mohan played the Aunt and son-in-law roles respectively. The family drama woven around the characters of Aunt and Son-in-law had attracted the attention of all sections of audience with the film, GADASARI ATTHA SOGASARI ALLUDU, directed by Katta Subbarao ( released on 20 June, 1981). The un-common combination of legendary actor, Bhanumathi as aunt and Super Star Krishna as her son-in-law, had created a stir and paved the path for the other films of this genre in the later times. The same magic was created with ANASUYAMMA GARI ALLUDU (1986) with the combination of Sharada and Balakrishna, directed by A. Kodandarami Reddy. The film got the applause from the masses and got the success in rural centres. In the sojourn of ATTHA- ALLUDU genre movies, it is Chiranjeevi, who created a standard of teasing and challenging Attha and playing all the fun related entertainment with her. The movie, ATTHAKU YAMUDU AMMAAYIKI MOGUDU (released on 14 June, 1989) is a best example of this sort, which made an indelible mark in the history of Tollywood as the biggest family entertainer of that times! The unusual combination of Vanisree and Supreme Hero Chjiranjeevi had set the theatres on fire, thanks to the powerful charisma and the performances of both the stars! The story-line developed based on the tete-a-tete relationship between Atha and Alludu had taken another step forward with the movie, ALLUDAA MAJAAKA (released on 25 February, 1995), directed by EVV Satyanarayana. The movie had faced several criticisms for its double-meaning dialogues and derogatory scenes between Aunt and Son-in-law, portrayed by Lakshmi and Chiranjeevi respectively! Even the women aactivists have expressed their dissent and performed processions across the state over the defamatory content. Later on, the movie was re-edited in certain scenes and got some ‘cuts’ too! Hero Nagarjuna too take a plunge with this formula and made a film, ALLARI ALLUDU to Vanisree! This film also followed the same route of tease-play-make fun of Attha and turned out to be a mass film! The young-gen heroes of 2000s have also experimented the formula of ATTHA – ALLUDU combo. But is noteworthy that, this formula had not clicked with them and proved as the flop-show! From the younger brigade of Tollywood, NTR is the first hero, who tried this ATTHA- ALLUDU formula not only for ones but twice. At first, he starred opposite Nagma in ALLARI RAMUDU (directed by B. Gopal and released in 2002) and later with Ramya Krishna in NAA ALLUDU (directed by Mullapudi Vara and released on 14 January, 2005). But both the films had bitten the dust at the box-office, in spite of all the massy stuff like, double-meaning provocative dialogues, glamour of young heroines like Genelia, Shriya, Sameera Reddy etc. Senior Heroine, Roja, too done the role ATTHA twice with young hero, Gopichand in his latest films. She acted as the Aunt to him in GOLIMAAR, a Puri Jagannath directed flick. And the other one is, MOGUDU, directed by Krishna Vamshi. 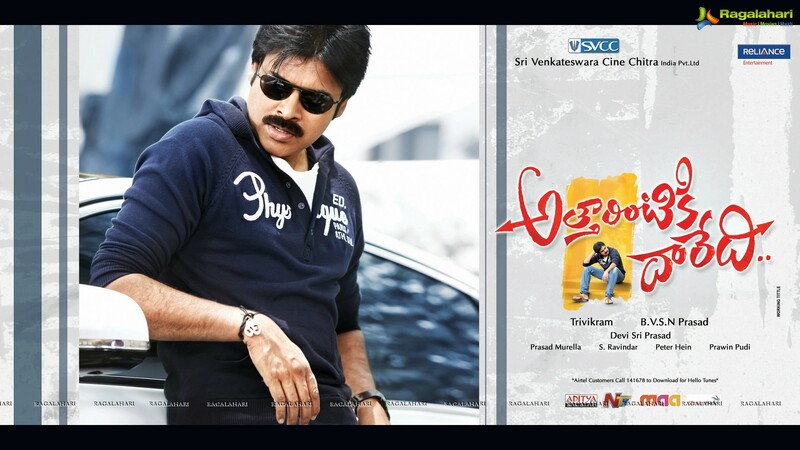 Now, it’s the turn of Powerstar Pawan Kalyan, who came with the formula of ATTHA –ALLUDU with ATTHAARINTIKI DAAREDI! Here, he acted with Senior Heroine, Nadia, who played the role of Attha! The film had portrayed ATTHA into a dignified on the lines of mother, which gave no scope for all the Tollywood-formulaic tease-threat-tempt styles of ALLUDU with ATTHA! Thus, made the movie as the clean entertainer of special sort! If we closely look into the actresses played the role of ATTHA so far, it is crystal clear that, they are once the reigning heroines of their times and have a great craze in the minds of the audience of those times! These characters have again elevated their popularity in the public and became a news and got all the publicity. S. Varalaxmi, Bhanumathi, Sharada, Vanisree, Lakshmi, Roja, Nadia had enjoyed the status of crazy heroines of their times and combining with the young Heroes of their age, had became a sensation itself! If we analyse in deep, it will be revealed that, the Tollywood so far, had followed 2 Formulae in designing the character of ATTHA on screen. This style of ATTHA character is basically very rich, royal and wears an attitude of damn-a-care under her sleeve! She is a head-strong lady of great pride, who will dominate and dictate the terms over her family. She is bitten with Affluenza and exhibits her snobbery all the time to others through costumes, jewellary, on one hand and insulting others and making mockery over the poor people and hatred towards them on the other. She is after high-class socialite life and throws lavish parties and power-mongering in nature. She is the personification of Egoism and moody. And definitely, she will have a hen-pecked husband or an estranged one! This formula had designed the character of ATTHA as an extension to Mother, who have self-respect and self-confidence as her strengths. Though she seems to be proud, it is due to her own commitment and level of self-style nature and individuality only. The success of latest film, AD, will definitely give again a boost to all the other producers/ directors to follow the suit and to create story lines on the theme of ATTHA ALLUDU concept! Hi folks, be prepare your self to watch more ATTHA- ALLUDU family dramas too in the near future!